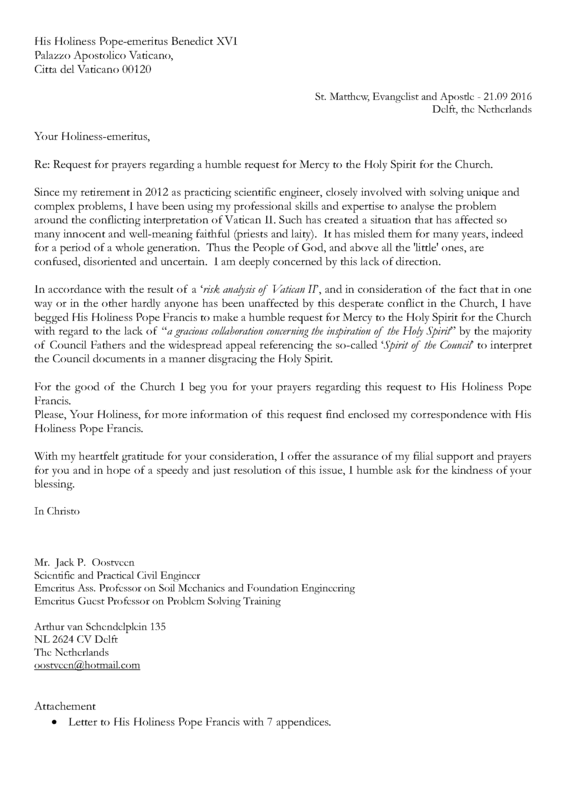 Recently, last September 21th and unknown of the Dubio that was sent to His Holiness Pope Francis by four Cardinals, a letter was sent to His Holiness begging him to make a humble request for Mercy to the Holy Spirit for the Church. Obviously, it has to be concluded that the emergency about which Blessed Pope Paul VI spoke in 1972 had manifested itself already shortly after Vatican II in the opposition to the encyclicals Mysterium Fidei and Humanae Vitae, as well as the Credo of the People of God. Similarly, it has remained a factor during all post-Council Pontiffs, Pope John Paul I, Pope John Paul II and Pope Benedict XVI, and even when you became the reigning Pontiff. This has affected so many faithful so deeply. Furthermore looking at the large numbers of ambiguities as well as the contradictory compromise text phrases in the Council’s documents as a source for many conflicts even in today’s Church, it is imperative that the real problem should be identified. 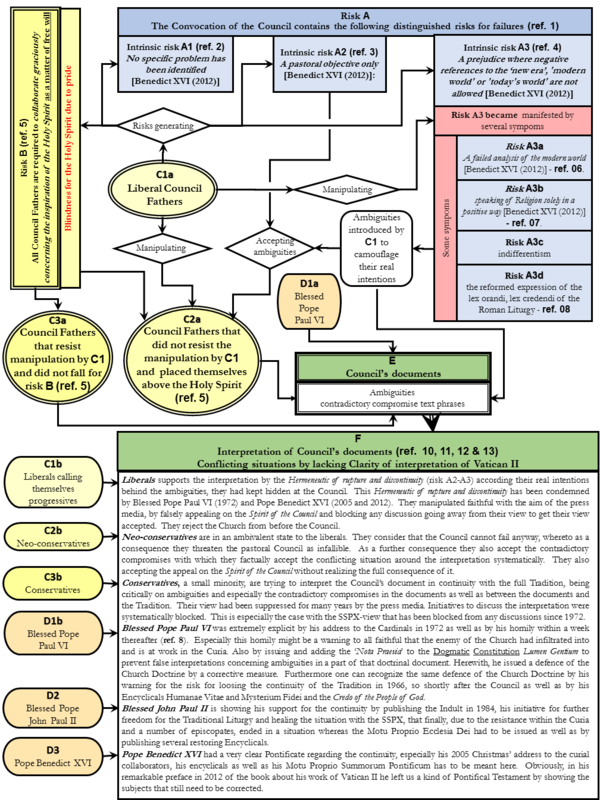 This problem was and remains the lack of “a gracious collaboration concerning the inspiration of the Holy Spirit” by a majority of the Council Fathers and the widespread appeal referencing the so-called “Spirit of the Council” to interpret the Council’s documents in a manner that disgraces the Holy Spirit. 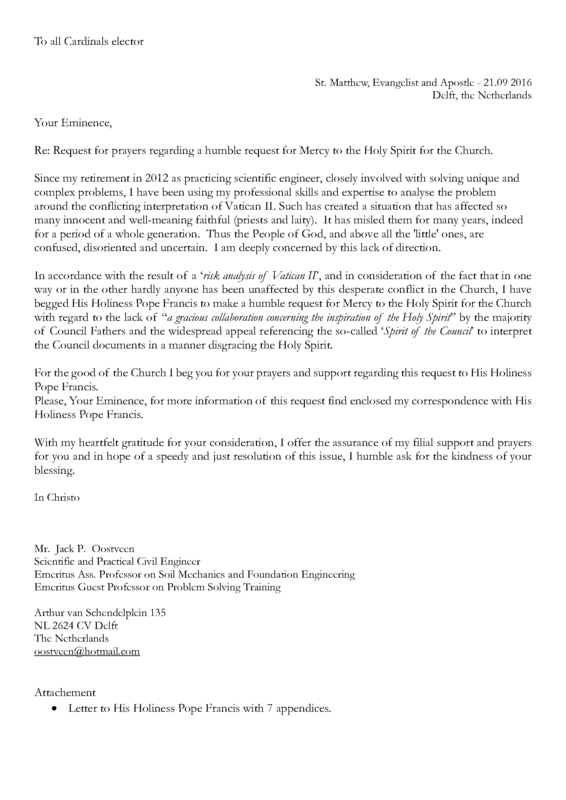 Please, Your Holiness, in accordance with the results of this risk-relationship analysis, and in consideration of the fact that in one way or the other hardly anyone has been affected by this desperate conflict in the Church, I beg You to make a humble request for Mercy to the Holy Spirit for the Church with regard to the lack of “a gracious collaboration concerning the inspiration of the Holy Spirit” by the majority of Council Fathers and the widespread appeal referencing the so-called ‘Spirit of the Council’ to interpret the Council documents in a manner disgracing the Holy Spirit. This is strongly proposed as absolutely necessary for resolving the conflicting situations inside the Church which still continues since the close of Vatican II for more than 50 years ago. This proposal may well be necessary for corrective measures to come into full effect as well as to achieve the convoked objective of the Council, i.e. the “New-Evangelisation”. 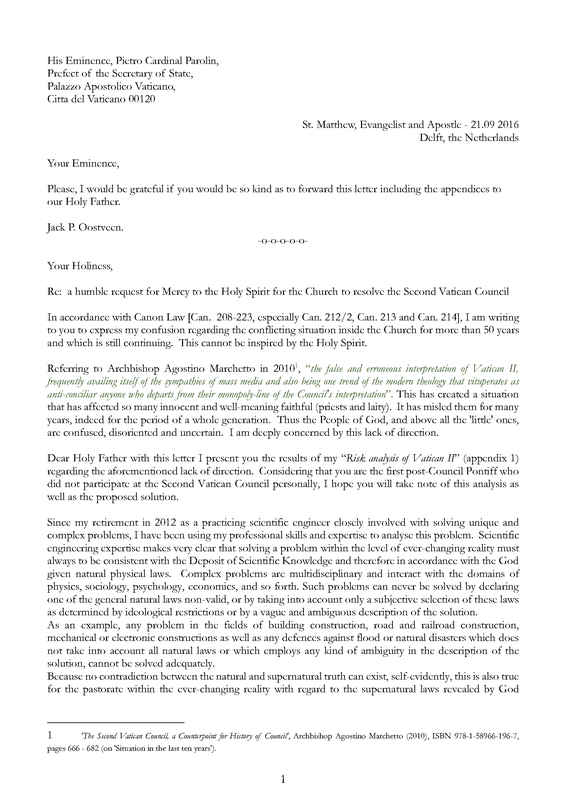 Besides this letter to His Holiness Pope Francis at the same date a letter has been sent to His Holiness Pope-emeritus Benedict XVI for a request of his prayer regarding the the request to Pope Francis. The same has been done in a letter sent to all 110 Carinals-elector. Furthermore during the proces upto this request to His Holiness Pope Francis in the recent past two more letters has been sent to the Congregation for Doctrine of Faith. 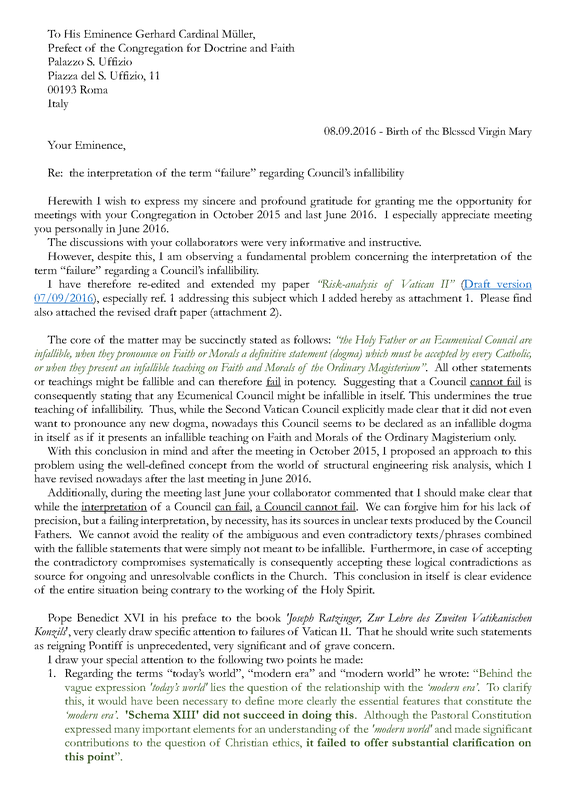 * Firstly a letter for Clarity on Vatican II, how to interpret the Council documents. 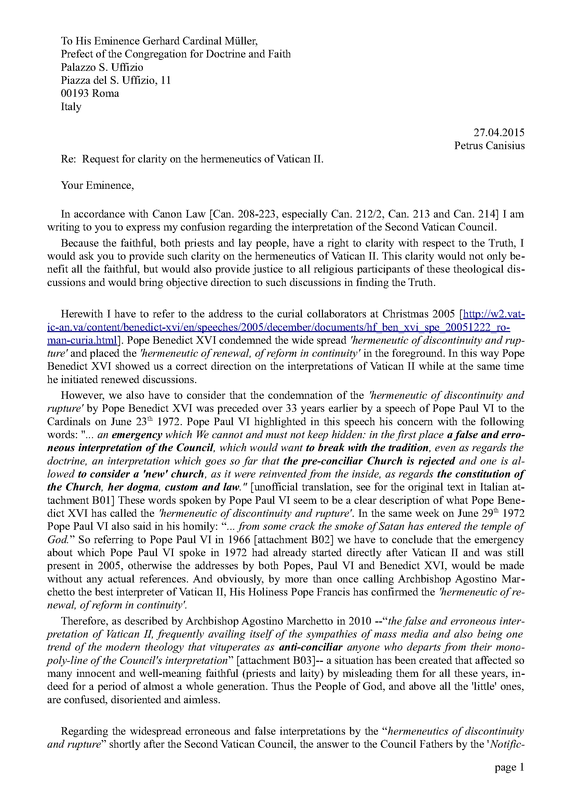 * Secondly a letter discussing the fallibilty and infallibility of Vatican II. ... Because no contradiction between the natural and supernatural truth can exist, self-evidently, this is also true for the pastorate within the ever-changing reality with regard to the supernatural laws revealed by God through His Son, our Lord Jesus Christ and by the Church’s Tradition and documents inspired by the Holy Spirit, known as Depositum Fidei. Re: Request for prayers regarding a humble request for Mercy to the Holy Spirit for the Church. Since my retirement in 2012 as practicing scientific engineer, closely involved with solving unique and complex problems, I have been using my professional skills and expertise to analyse the problem around the conflicting interpretation of Vatican II. Such has created a situation that has affected so many innocent and well-meaning faithful (priests and laity). It has misled them for many years, indeed for a period of a whole generation. Thus the People of God, and above all the 'little' ones, are confused, disoriented and uncertain. I am deeply concerned by this lack of direction. For the good of the Church I beg you for your prayers and support regarding this request to His Holiness Pope Francis. Please, Your Eminence, for more information of this request find enclosed my correspondence with His Holiness Pope Francis. ... However, we also have to consider that the condemnation of the 'hermeneutic of discontinuity and rupture' by Pope Benedict XVI was preceded over 33 years earlier by a speech of Pope Paul VI to the Cardinals on June 23th 1972. Pope Paul VI highlighted in this speech his concern with the following words: "... an emergency which We cannot and must not keep hidden: in the first place a false and erroneous interpretation of the Council, which would want to break with the tradition, even as regards the doctrine, an interpretation which goes so far that the pre-conciliar Church is rejected and one is allowed to consider a 'new' church, as it were reinvented from the inside, as regards the constitution of the Church, her dogma, custom and law" [unofficial translation, see for the original text in Italian attachment B01]. ... On one hand this can be considered as a Serviceability Limit State failure mode at which the Holy Spirit is respecting the free will of man, while on the other hand the Holy Spirit is protecting the Council supernaturally from the Ultimate Limit State failure mode by preventing it from absolute heresies, just by these ambiguous and contradictory texts phrases. This is what makes the Serviceability Limit State failure mode resolvable by addressing appropriate corrective measures in gracious collaboration with the Holy Spirit, and finally into a successful Council. ... The source of risk B was the arrogance of the Council Fathers (C2), as reported by Pope Benedict XVI (February 2013), “The Bishops said: no, let’s not do that. We are bishops, we ourselves are the subject of the Synod; we do not simply want to approve what has already done, but we ourselves want to be the subject, the protagonists of the Council” (reference 05 ). This hubris of the bishops lead them to lose sight of the true inspiration of the Council -- the Holy Spirit, the true Subject and Protagonist of the Council. This disregard for the original preparation for the Council may have blinded the participants to the guidance of the Holy Spirit. Such an attitude might even be considered a rejection of the Holy Spirit on the part of a majority of the Council Fathers, whereas a gracious collaboration concerning the inspiration of the Holy Spirit is required.